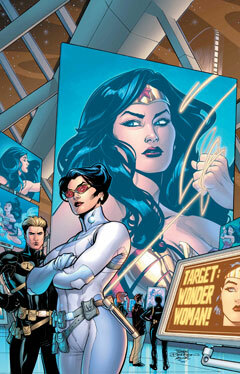 Diana Prince is on the hunt for her alter-ego Wonder Woman in Jodi Picoult's first issue for DC Comics. It's not often a best-selling author gets an additional bump in publicity for outside projects, but that's the enviable position Jodi Picoult is in right now. Currently on a national tour in support of her latest and well-received 14th novel, "Nineteen Minutes" (see accompanying review), Picoult is also the source of interest for being only the second female ever to write for one of DC Comics' iconic characters, Wonder Woman. "Love and Murder," the first of her five-part story arc in the relaunched title, was just released in stores Wednesday. If you haven't been following the adventures of the Amazonian goddess lately, you need to know that Wonder Woman no longer is considered a blazing light of justice. She's now a fugitive-in-exile for killing a federal agent -- albeit an evil and corrupt one driven to take down all superheroes -- in a very public fashion, i.e., satellite television. Luckily, the superheroine has her alter ego, Diana Prince, to fall back on. Or does she? Prince is a special agent for the Department of Metahuman Affairs, and she and her disgruntled partner, Tom Tresser (aka master of disguise Nemesis), are ordered to find Wonder Woman and bring her in for questioning. But how can Prince surrender herself to the authorities? Before that predicament, however, she has to deal with the kidnapping of her partner by the goddess's arch rival, the sorceress Circe, who's a particular favorite of Picoult's from the Wonder Woman gallery of supervillains. This foray into comics came about after Picoult included a graphic section in her previous novel, "The Tenth Circle." That caught the attention of the wife of DC Comics editor Matt Idelson, who then approached Picoult to do a Wonder Woman story. "I didn't believe that it was really (Matt) at first when the e-mail came in," said Picoult via the same. 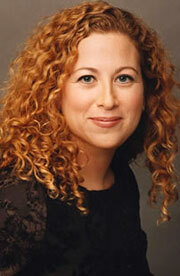 With additional prompting from her three children, Picoult agreed to sign on. The author plans to flesh out, as well as have fun with, the iconic character in her own inimitable fashion. Wonder Woman's Amazon sisters will figure in to the total picture, as will her mother, Queen Hippolyta. With a mother-daughter conflict and identity issues to be addressed, Picoult said, her story will revolve "around the fact that part of growing up is understanding the person you become may not be the same person your parents expected or hoped you'd be -- and that there's a difference between duty and desire." Now that she's publicly talking about two high-profile projects of hers, Picoult said that "Wonder Woman has enhanced the promotion of 'Nineteen Minutes.' In fact, media sources that are never interested in fiction or novelists have interviewed me because they are intrigued by the fact that I'm also writing 'Wonder Woman.' She's got fans everywhere!" Though Picoult initially became interested in comic books by reading Marvel's "X-Men" when the title grew in popularity during writer Chris Claremont's lengthy run, she said no one from DC's rival company has contacted her about doing a story, albeit a mutant-powered one, for them. "And to be honest, if I were to go back to writing a comic book, it would be hard to let go of 'Wonder Woman.' She was simply too much fun to do."